I remember growing up hearing from the KJV that, “God is no respecter of men.” I have to admit it sent a rather confusing message. I was supposed to respect people, but God did not? Well since then, I have learned a little bit more about God, His relationship with humanity, and I also started using a different translation of the Bible. 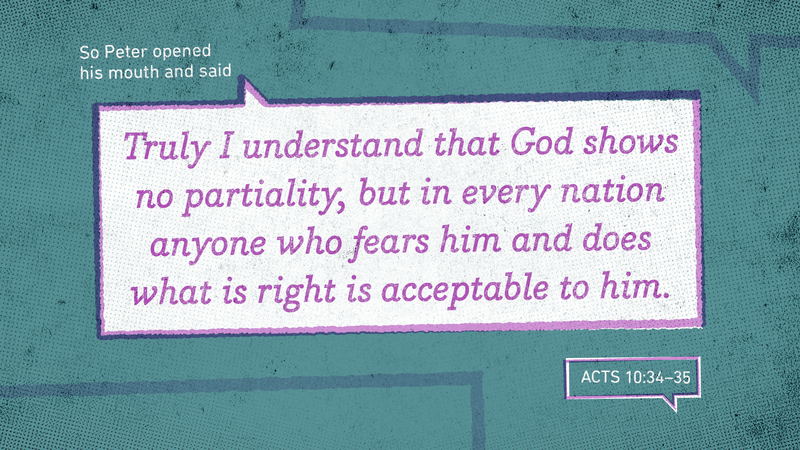 Now I read, “God shows no partiality.” Essentially, it means God doesn’t show favoritism. In fact, “no partiality” is the preferred reading in such translations as the NKJV, ESV, and the NAS. Why does God show no partiality? Well, Job’s friend Elihu revealed the source of God’s impartiality when he said, God “shows no partiality to princes, nor regards the rich more than the poor, for they are all the work of His hands” (Job 34:19; cf. Proverbs 22:2). This is key to understanding God’s impartial nature, especially when we come to the New Testament. Acts 10 is a great moment of change in the salvation history. Up until that time, the gospel had only been preached to Jews and the quasi-Jewish Samaritans. But finally, following divine intervention (10:1-23), Peter takes the gospel to the Gentiles. When he arrived, Peter opened with these words, “Truly I understand that God shows no partiality, but in every nation anyone who fears Him and does what is right is acceptable” (10:34-35). No longer was salvation and fellowship with God exclusive of the Jewish nation. In the new age of Christ, every nationality is welcomed into the kingdom of God. Paul touches on this theme in Romans 2:6-11 where he said, “[God] will render to each one according to his works” whether they be evil or good (vv. 6-8) regardless of one’s ethnicity (vv. 9-10). The “Gospel,” Paul said, “is the power of God for salvation to everyone who believes, to the Jew first and also to the Greek… [for] ‘The righteous shall live by faith’” (Romans 1:16-17). This passage also confirms that when it comes to salvation, God shows no partiality based on ethnicity or nationality. What’s the take away for us? That we should take the gospel to everyone regardless of who they are or where they are. Salvation and the gracious reward of eternal life are not based on who we are, but the life we live in faith. This is the foundation of the great commission (Matthew 28:18-20), and we need to be about our job of taking the gospel to the masses, keeping in mind that, “if [we] show partiality, [we] are committing sin” (James 2:9). A few years after the events of Acts 10, a crisis had hit the church, teachers known as Judaizers had infiltrated a number of churches and were teaching that in order for Gentiles to be saved they must keep the Law of Moses (ref. Acts 15:1, 5; Galatians 1:6-10; 2:15-21). One area these teachers were especially troublesome was the region called Galatia. Within a short time after Paul’s departure from the region, the Judaizers had shown up leading a good number of people astray (cf. Galatians 1:6). To bolster their authority, the false teachers claimed they had the backing from the influential apostles and teachers in Jerusalem: Peter, James, and John and Paul did not. The Judaizers had likely made a habit of exalting these three leaders at the expense of Paul. Paul sarcastically makes a play off of the Judaizers’ name-dropping of these three men calling them “those who seem to be influential” (Galatians 2:2, 6, 9). As Paul makes his appeal that the he was accepted by these very men and the other apostles, and therefore the Galatians should accept him and his gospel, Paul appeals to the impartial nature of God (v. 6). No doubt, the Twelve apostles did have the unique privileges, i.e. of being with Christ from the beginning of His ministry (cf. Acts 1:21-22). However, their unique privileges did not make their apostleship any more legitimate or authoritative than Paul’s, since Christ commissioned them all (ref. Romans 2:11). Furthermore, Paul never saw himself as apostolically inferior (ref. 2 Corinthians 12:11-12) because God shows no partiality between His servants. What’s the application for us today? Because God is impartial, then we should receive all teachers of truth. We should not elevate one above another, or develop camps around this one and around that one. This was exactly what the church at Corinth had done and Paul condemned their actions (ref. 2 Corinthians 3:1-9). They were showing partiality. However, God is impartial when it comes to the use of His servants, therefore, we should be impartial in our receiving and listening to His various servants. Slavery was a fact of first century life. From the instructions given throughout the epistles, it is evident that early congregations were composed of both slaves and masters (ref. Galatians 3:28; Ephesians 6:5-8; Colossians 3:11, 22-25; 1 Timothy 6:1-2; 1 Peter 2:18-25). In this world, masters had nearly unlimited power over their slaves, even to the point of life and death. However, Paul artfully used God’s impartiality to teach a new and different way for believing masters to treat their slaves, while urging slaves to serve their masters in honorable ways. In his letter to the Ephesians, Paul instructed believing masters to treat their slaves with mutual honor and respect and “stop your threatening” (Ephesians 6:9a). That is, stop using your authority and power to intimidate and threaten your slaves. Remember, Paul warned, “He who is both their Master and yours is in heaven, and that there is no partiality with Him” (Ephesians 6:9b). The Master should remember that he too is a slave of the Heavenly master. Therefore, he should treat his slaves with the same amount of grace and mercy he has received from his Master. If he does not, he should remember that with God, “there is no partiality.” The master’s earthly status will not help him in the Day of Judgment when he stands before his Master to give account of his stewardship. In contrast, Paul used God’s impartial nature in his letter to the Colossians to spur believing slaves to obey their masters no matter what. “Slaves, obey in everything those who are your earthly masters, not by way of eye-service, as people-pleasers, but with sincerity of heart, fearing The Lord. Whatever you do, work heartily, as for the Lord and not for men, knowing that from the Lord you will receive the inheritance as your reward. You are serving the Lord Christ. For the wrongdoer will be paid back for the wrong he has done, and there is no partiality” (Colossians 3:22-25). Paul urged believing slaves to work for their earthly masters in a way consistent with being slaves of, “the master Christ.” This teaching applied to every slave, regardless of station or the spiritual state of their masters. If the slave failed to heed these instructions he could be sure his heavenly Master would punish him accordingly, since “there is no partiality” with Him. What should we see in these two examples? Because God is impartial, eternal punishment will be dealt out to all who sin, regardless of their social status in this life. Just as salvation is open to all, so is eternal punishment. Our deeds in this life, not our station, or lot in life determines whether or not we will be saved or punished in eternity. This is what Peter taught in 1 Peter 1:17 where he said, “If you call on His as father who judges impartially according to each one’s deeds, conduct yourselves with fear throughout the time of your exile.” Therefore, God’s impartiality in judgment should serve as a motivator in our lives to obey the commands of our Lord (cf. Deuteronomy 10:17). As we have seen, because God is the creator of all humanity He is impartial. Therefore, this fact should motivate us to share the gospel with everyone. It should deter us from forming camps around different preachers of the gospel. Finally, it should cause us to obey God so as to not incur His judgments. Let us be people who live lives in light of God’s impartiality, doing what He has said, being the people He wants us to be. It would be my pleasure to help you on your spiritual journey. You can always contact me via email me at clay@claygentry.com. Until next time, keep Sharing The Good News.